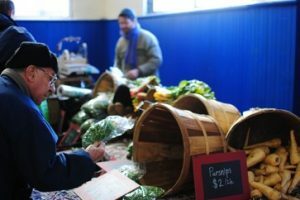 The Cambridge Winter Farmer’s Market kicks-off the 2018 season this Saturday, January 6th. The market will feature nearly 40 vendors offering fruits, vegetables, bread, meat, fish and more. A $15 match is offered on SNAP purchases, and many products are also HIP (Healthy Incentives Program) eligible. If you’re planning to use your EBT card to access SNAP, SNAP Match, or HIP benefits, be sure to check in with Anna, the Market Manager, prior to making your purchases to get the most from your benefits. The market will be open every Saturday beginning January 6th and ending April 7th! For more information on 2018 vendors, including those that are SNAP and HIP eligible, visit here. For more information on the Cambridge Winter Farmer’s Market, visit here.